Crazy patchwork on to foundation material with the edges of the pieces turned under and machined. It is not quilted. A 25mm red binding has been machined on. There is no padding. The backing is red wholecloth cotton. At this time it is impossible to make a definite attribution to Sarah Marshall but this quilt was almost certainly made by Sarah Marshall and/or one of her daughters, Hannah, Jean or Agnes at Hill End NSW and probably at 'Craigmoor' their family home. The exact date is unknown. It is now part of the 'Craigmoor' collection owned by the NSW National Parks and Wildlife Service and displayed at 'Craigmoor'. James Marshall (1828-1905) from Scotland via the Californian gold rush and Sarah Langslow Adams (1836-1926) born Herefordshire England, were married in 1858 at Hill End. Reef mining in the 1860s brought fame and fortune to this mining settlement, north of Sofala and Bathurst in NSW. In 1875 James Marshall had 'Craigmoor' built and he and Sarah lived there with their family of 9 children, 2 having died in infancy. The textile collection at 'Craigmoor', including the quilts, reflects the Marshall women, Sarah and her daughters Hannah (1859-1950), Jean (1867-1948) and Agnes (1871-1950) and gives a glimpse of the daily lives of the women. Needlework, including crochet, in various forms was important and some of the women made their own hats. 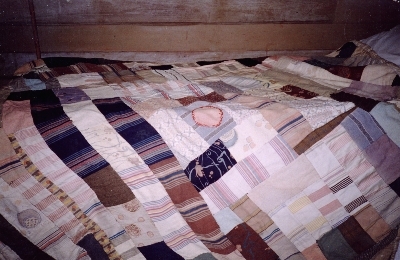 At least in the later years it appears to have been a thrify household with many quilts made over and patched. Hannah, a spinster, lived at 'Craigmoor' from the time it was built until her death aged 91. She taught Sunday school in Hill End and was well know locally for her bottling, preserving and jam making. She also made elderberry wine. The 3 sisters were fond of playing the piano.